1. Sunrise International Labs Ltd - Walk-In for B.Pharm, M.Pharm, B.Sc & M.Sc Exp. Candidates for QC on 8th Feb' 2019. 2. Anthem BioSciences - Walk-In Interview for Quality Control on 9th Feb' 2019 @ Bangalore. 4. SMS Lifesciences India Ltd - Walk-Ins for Multiple Positions (70 Positions) on 8th & 9th Feb' 2019 for Production / QC / QA / R&D. 5. Optrix Laboratories - Walk-In Drive for Freshers & Experienced for Production on 5th to 9th Feb' 2019. 6. Aurobindo Pharma - Freshers Walk-In Interview on 8th Feb' 2019 @ Hyderabad..
7. Syngene International - Walk-In Drive for Discovery Chemistry on 9th Feb' 2019 @ Bangalore. 8. 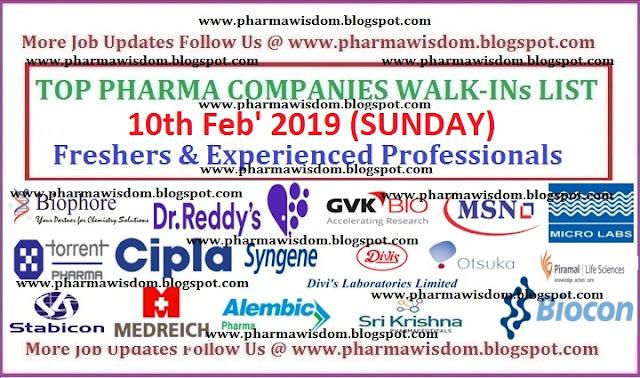 Recipharm - Walk-In Interviews for Analytical Development on 9th Feb' 2019 @ Bangalore. 9. Cognizant - Walk-In Drive for B.Pharm / M.Pharm / Pharm.D Freshers on 8th Feb' 2019 @ Hyderabad..
10. Walk-In Interviews for B.Pharmacy Freshers on 8th Feb' 2019 @ Aurobindo Pharma Ltd (ATDC)..
11. Pharma Patashala Conducting Walk-In Interviews on 9th Feb' 2019 for Mfg, QA, Warehouse, R&D, Solvent Recovery System @ Hyderabad..
12. Tenshi Kaizen Pvt. Ltd - Recruitment Drive for Quality Control on 9th Feb' 2019 @ Bangalore..
13. Jubilant Generics Ltd - Walk-In Interviews for Production, QC, QA, Granulation, Compression & Coating on 10th Feb' 2019..
14. Walk-In Interviews for Freshers - R&D / QC / Production on 7th, 8th & 9th Feb' 2019 @ Hyderabad..
15. Strides Pharma - Walk-In Interviews for QC, Warehouse, Production, Facilities & Engineering on 9th Feb' 2019. 16. MICRO LABS LIMITED - Walk-In Interviews on 9th Feb' 2019 @ Bangalore..
17. NEULAND LABORATORIES - Walk-In Interviews on 9th Feb' 2019 @ Hyderabad..
18. IOL Chemicals & Pharmaceuticals - Walk-Ins for Production, QC & R&D on 10th Feb' 2019..
19. Pfizer India - Walk-In Drive on 9th & 10th Feb' 2019 for Regulatory Affairs..
20. HY-GRO Chemicals - Walk-In Drive for Freshers & Experienced Trainee Chemists on 9th Feb' 2019 @ Vizag..
21. Biophore India Pharmaceuticals - Walk-In Interviews of R&D (Synthesis / Process) on 9th Feb' 2019..
22. ARISTO Pharmaceuticals - Walk-Ins for QA, QC, Stores, Production & Packing on 10th Feb' 2019..
23. LUPIN LIMITED - Walk-In Interviews on 9th & 10th Feb' 2019 @ Aurangabad..
25. Walk-In Interviews for Freshers @ Solara Active Pharma Sciences on 9th Feb' 2019..
26. Sri Krishna Pharmaceuticals - Walk-Ins for QC & Analytical QA on 6th to 9th Feb' 2019 @ Hyderabad..
27. Intas Pharma - Walk-In Interview for Multiple Openings - QA, QC, Injectables & Warehouse on 10th Feb' 2019. 28. Honour Lab Limited - Walk-Ins for Freshers & Experienced Multiple Positions on 9th & 10th Feb' 2019 @ Hyderabad. 29. Zydus Biologics - Walk-In Interviews for Freshers on 10th Feb' 2019 @ Ahmedabad..
30. Sai Life Sciences - Walk-In Drive for Production on 10th Feb' 2019 @ Pune..
31. GVK BIOSCIENCES - Walk-In Drive on 10th Feb' 2019 @ Pune & Kolkata. 32. Alembic Pharmaceuticals Ltd - Walk-In Interviews on 8th Feb' 2019 @ Vadodara..
33. Lantech Pharmaceuticals - Walk-Ins for Multiple Vacancies in Manufacturing, QA, Warehouse, Solvent Recovery System & R&D on 9th Feb' 2019 @ Hyderabad..
34. Medopharma Pvt. Ltd - Walk-In Interview for B.Pharm / M.Pharm Freshers on 11th Feb' 2019 @ Chennai..
35. Vital Pharma - Walk-In for Freshers for Sales Department (Dispatch) on 9th Feb' 2019 @ Hyderabad..
37. Freshers Walk-In Interview for B.Pharm / M.Pharm / M.Sc Candidates on 12th Feb' 2019 @ HETERO..
39. Walk-Ins for QA, QC, Production & Packing - Multiple Openings @ Sun Pharmaceutical Ltd on 10th Feb' 2019..
40. SANOFI - Walk-In Interviews on 16th Feb' 2019 @ Hyderabad..
41. Syngene - Walk-In Drive for QC Biologics on 16th Feb' 2019 @ Hyderabad..
42. Anthem BioSciences - Walk-In Interviews on 23rd Feb' 2019 for Biologicals Manufacturing..
43. Accuprec Research Labs - Walk-Ins for ADL, QC, QA, Pharmacology, Microbiology, Accounts, HR Dept. on 24th Feb' 2019..
44. Denis Chem Lab Ltd - Walk-Ins for Production, QC, QA, Store, Microbiology, Maintenance & HR on 9th & 10th Feb' 2019..
45. MSN Laboratories Pvt. Ltd - Walk-Ins for B.Pharm, M.Pharm & M.Sc - QC Dept. on 9th Feb' 2019..
46. Alkem Laboratories Ltd - Walk-In Interviews on 10th Feb' 2019 for Operator / Technician / Executive / Officer / Sr. Officer..
47. AUROBINDO PHARMA - Walk-In Drive for Multiple Positions - Regulatory Affairs on 10th Feb' 2019 @ Chennai..
48. Yeluri Formulations Pvt. Ltd - Walk-In Interviews for QA / QC / Production on 9th Feb' 2019 @ Hyderabad..
49. Wipro - Walk-In Interviews for Freshers & Experienced PV Candidates on 11th & 12th Feb' 2019..
50. GLAND PHARMA LIMITED - Walk-Ins for Multiple Vacancies on 14th Feb' 2019 @ Hyderabad..